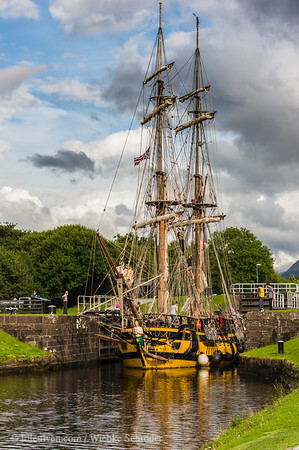 Caledonian Canal, Caol, Scotland, United Kingdom La Grace is a replica sailboat of the brigg class. A two-mast boat with square sails. The original ship belonged to Augustine Herman, a merchant from Bohemia, in the 1800s. Though keeping true to the historic boat, the replica has inside all modern equipment necessary for safe travels, including rescue boats and a diesel engine. uuid="5CFDC315-326F-4CEC-B8D2-7964C59C8AC4" id="United Kingdom lilleulven.com _K3_8455.dng Scotland Lilleulven.com"